Sometimes our furry friends suffer an accident or a disease, and they are unable to walk anymore properly or move at all. In that case, as a pet owner and friend, you would do everything you can in your power to enable your dog to have a normal life and not let him suffer. Instead of putting a dog down, many owners decide to go for a wheelchair or cart and enable their old or sick pets a few more years of joyous and comfortable life. That is why dog wheelchairs are a great invention because they enable dogs to live longer and more importantly, they make this experience painless and easier. This article will provide you with a simple guide on how to make a dog wheelchair at home, depending on the severity of your dog’s disability and his size; and it will also present you with some tutorials and interesting videos related to the topic. One of the benefits related to building your own dog wheelchair is that it is simply a lot cheaper. This is very important if your budget is limited and if you have already too many expenses related to either your dog’s medical condition or yourself. In that case, buying or borrowing some of the materials and supplies would be much cheaper than ordering a custom made wheelchair. Another benefit is that you can choose the materials by yourself, especially if you need them lighter or if you need the measurements to be perfect. Not every dog has the same size even the ones of the same breed. If you are not experienced in handling similar matters, then make sure to do research on the net or ask your friends around. However, there are also some obstacles that you may face, and the first one would that your dog may tip the wheelchair over sideways when he runs around, even though you think it is wide and stable enough. In order to avoid or fix this, you can install longer axles in order to make a wider base. You can also angle the axles ever slightly, so as to tilt the wheels inward, which is referred to as camber. In order to fix the second issue, you should just move the rear cross-pieces upward and in such way, the frame will seem to maintain its stiffness while allowing lots of free space underneath for a dog’s leg swing. Also, having in mind how cheap the materials may be, you can build more than one wheelchair – depending on how often your dog may change them. One can be used for the indoor activities, and the other one, sturdier, for the outdoor activities and games. First of all, you should decide on the design of your dog’s future wheelchair. This largely depends on your dog’s size and breed. However, if your dog is a tiny dog breed, it would be more difficult to create a wheelchair in such size than for example, a wheelchair for a Retriever. Additionally, it is more difficult for dogs that are moving very slowly and whose upper legs are disabled in a way too. You can start from a scratch or, if you know anything about digital drawing and planning, a program called AutoCAD, which stands for Computer-Aided Design, can be very useful. You can easily make any changes on the computer and you can adjust the digital wheelchair according to your dog’s measurements, including all of the tuning and fitting. Furthermore, you should choose the material, and most people would go for the square aluminum tubing and polycarbonate plastic plate for the main frame. The bigger the dog, the bigger the diameter wheels should be, because if your pet is large, he will probably come in contact with big rocks or bumps in the yard. In that case these wheels would easily roll over the obstacles and decrease the shock in their air-filled tires. The saddle would be probably the most complicated part because you should make it both solid and comfortable. It is the place where your dog’s lower body should be seated in an ideal position and it should not make him feel uncomfortable or be painful. Having in mind that it movies with your dog’s motions, it can lead to ulcers so you should be extra careful and regularly check your pet. Additionally, you can add a neoprene pad in order for it to absorb urine in case you are not able to take your dog to the toilet in another way. You can go for the nylon webbing strap material for the upper part of the saddle and it can also be heavily padded with a rubber tube and covered with a thick foam padding. If you put a special cover over it, it would make your life easier, simply because whenever you choose to wash and replace it, all you need to do is remove it. You should not bother with removing the whole padding of the saddle, which you would have to do if you do not place a cover over it. 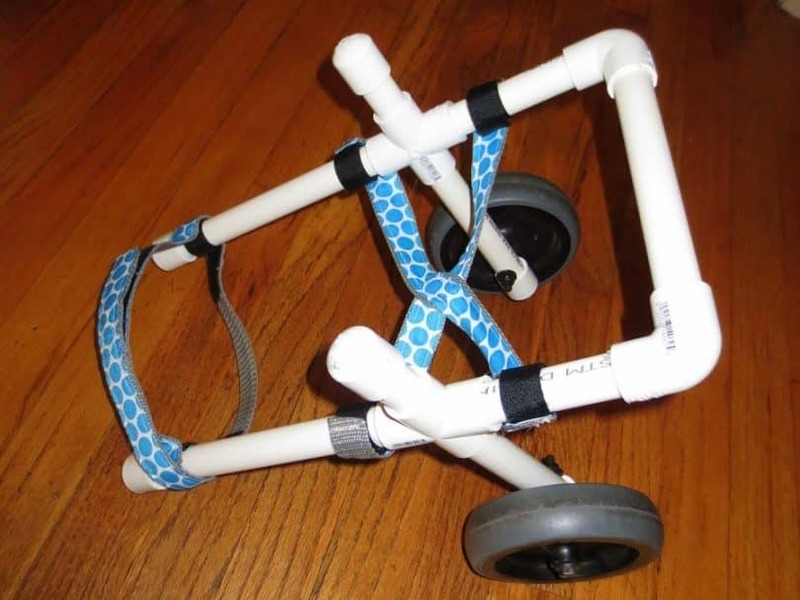 When it comes to tools that you will need during the process of creating a DIY dog wheelchair, you will definitely need a saw (in order to cut an aluminum and PVC pipe), fixed or adjustable wrenches, a drill, a set of clamps and a vise. You may also need some sewing materials, including straight pins, a pair of scissors, a sewing machine or a needle and thread. Other materials may include: PVC elbows, wheel axle, c-clips, epoxy adhesive, pool noodle, hammer, nylon webbing, thread, thimble, matches, wheels, nuts, clips, support harness, harness, glue, drill and drill bits, ace bandages etc. Some of these materials can be taken out if you decide that they are unnecessary, or you can add some of yours. If you are unsure about handling the whole process by yourself, you should ask a more experienced friend or professional, however, the point of building your own dog wheelchair is to make it suitable but cheaper. The process itself should not require the use of heavy duty equipment and the primary tool should be a saw in order to cut the long pieces of a PVC pipe into smaller segments. This should be a miter saw and do not forget to measure twice before and cut once, or you may end up buying more material because you did not pay enough attention in the first place. After that, you use the glue and piece the wheelchair together. It can be very fun if you liked playing with tinker toys in your childhood (or even now). Apply pressure in order for glue to stick properly, therefore you should try out a glue of high quality so the whole frame would not fall apart. After that, you should drill holes through the bottom tube by using a drill so you can insert the wheel axle and secure the two dolly wheels using the c-clips. However, if you are unsure about doing this by yourself, you should certainly get help of some more experienced individual or do more research on the net. The materials are not too expensive, but you should still try your best not to ruin any of them or stick them in a wrong way. Another thing that you should remember is connecting the shafts and the wheelchair in general to your dog. There should not be anything to rub against him otherwise he may develop ulcers and that would hurt. The best way to show you how to build a dog wheelchair would be to present an example of it. You can take a look at this video by an instructor Danny Goh and presenter f.hui, who decided to take matters into their hands and enable their and all of the other dogs in need of help to move more freely. The materials mentioned in the video include: a PVC glue, cable tie, hole sole of ½ inches, drill, a nut of 3 inches and screw, fabric, a wheel of 3 inches, plyer, PVC cutter, knife and a measurement tape. You would also need a ½ inch diameter PVC tape, and other tubes of various lengths, as you can see on the pictures below. You should also take your dog’s measurements into consideration, and pay attention to his body width, neck height, body length and body height. That is very important because if you do not calculate well, the wheelchair can be too tight and uncomfortable; and if it is too loose, your dog can trip over and hurt himself. It should be comfortable for him to move around and spend lots of time in it. The bigger the dog is, the sturdier and stronger the wheels should be, because they would have the hold all of the weight. The picture below shows some of the crucial elements: three tubes of a body weight, two tubes of a neck height, six L boxes, four T boxes, three tubes of 3 inches, two tubes of 8 inches, two tubes of a body height and two body long tubes. After that, the video demonstrates perfectly, step by step, how to build a wheelchair. All of the parts are numbered so you do not lose your way while sorting them out. If you follow the instructions carefully, you won’t have any problems. As you can see on the picture, the tubes are numbered so you can easily remember which one to use and where to connect it. This part can be very interesting and after that all you need to be careful about is not hurting your fingers while drilling the holes into the boxes. Take the tube #1 and put on the glue for every connection. Then put on the glue on two tubes #4 and connect them on each side of the tube #1. Then do the same with two tubes #3 and connect them to the ends of the tubes #4. After that add two more tubes #4 to the ends of the tubes #3. Then add two tubes #2 to their ends. After that you should add two tubes #5, two tubes #8 and two tubes #4. You should finish it by completing the piece with a tube #1. The next step would be to add the legs, which are the tubes #7. Now you have got the frame. Drill the holes into T boxes and put the bolts through the wheels’ openings. Secure them with the nuts and connect with the wheels. After that secure the piece with another nut. Create the pair of wheels and connect them to their place which is the tube #1. Sew or cut the fabric you have prepared and place it on the frame making sure there is 6 inches free at the end. Cut a hole for a cable tie and then by using the tie secure the fabric to the frame. Cut off the extra to make it smooth and to prevent the surface of hurting the dog. The fabric should not be too tight or too loose, because that would be uncomfortable too. 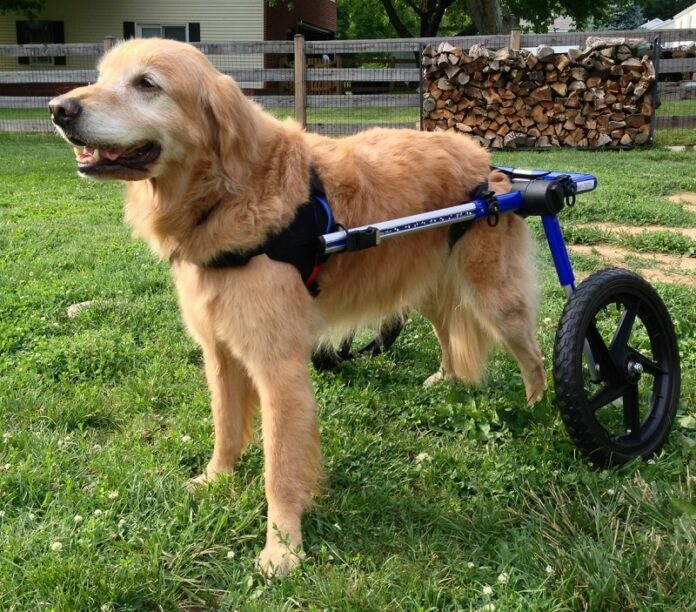 The result is a simple and comfortable doggie wheelchair that can be easily used. All you need to do is decide on the measurements and how to tie it to your dog without stressing him. Now all you need to do is have your dog try it! Do not forget that you must adjust the measurements to your dog’s size and not the ones presented here in the video and pictures. You can also check out a YouTube channel called Handicapped Pets, which is dedicated to pet owners and their dogs, so they can learn to cope with their pets’ disability and most importantly, to learn how to use the dog wheelchairs. This channel is great because it can show you that dogs can live happily even with disability and that doggie wheelchairs are great inventions that can improve their lives. There are many videos sent by the actual owners who show their disabled pets running around in wheelchair, barking and playing games. It is emotional to see a happy dog that despite all of the circumstances managed to still play with his owner and friend. It is also great because you can come up with some creative ideas concerning your DIY dog wheelchair. Another very important thing to remember is that, after building your DIY dog wheelchair, you should pay special attention to your dog’s habits and exercise him as much as he is allowed to (this is complicated when it comes to senior dogs). You should never give up, especially because it will be hard to get your dog accustomed to the wheelchair, but you should make sure to distract him by it by playing games with him. There are many examples of disabled dogs (just like humans) who are joyous and energetic even after the accident or surgery. That is because they are full of life and want to enjoy it with their owners. It is up to you to provide them with the best equipment so they can still move around and run in it, or simply rest without dragging their legs after them. To sum up, we have covered some of the most important materials and supplies when it comes to building a DIY dog wheelchair at home. Some of these materials include a saw, fixed or adjustable wrenches, a drill, a set of clamps and a vise. You may also need some sewing materials, including straight pins, a pair of scissors, a sewing machine, a needle, thread and many more. We have also explained the process and showed an example which perfectly demonstrates a similar process of building a dog wheelchair. The benefits have also been mentioned, such as doing your own design for a cheaper price. When it comes to the reasons why your dog should use a wheelchair, there are many: an accidents, diseases (cancer, arthritis…) or an old age which makes senior dogs susceptible to already mentioned diseases. All in all, when a dog loses a limb or more, he depends on you, as his owner and best friend, to enable him painless and easier life. We have also mentioned two videos – one of them is a tutorial on how to build your own dog wheelchair, which is very informative and practical; and the other one is a channel where you can take a look at various videos related to dog disability and the way they use wheelchair. It can give you interesting and creative ideas about building your own wheelchair.